Each week I take the list from my Master To Do List and I just copy and paste it into a new list labeled as the dates of the week. From there I make any edits I need to such as replacing the generic “Post” tasks for each blog post with the actual title of the post that will be going up each day. I also add in any other tasks I have for the week. My list each week is pretty simple. I just put the main tasks I need to get done rather than adding every single thing I want to accomplish. This keeps me focused and I can generally see most of the week without having to scroll too far. Just by glancing at my weekly to do list I can kind of get an idea of what I need to work on next. My Evernote to do list system isn’t all that fancy or well thought out, but it works! The most important thing to keep in mind when creating a system is that it works. 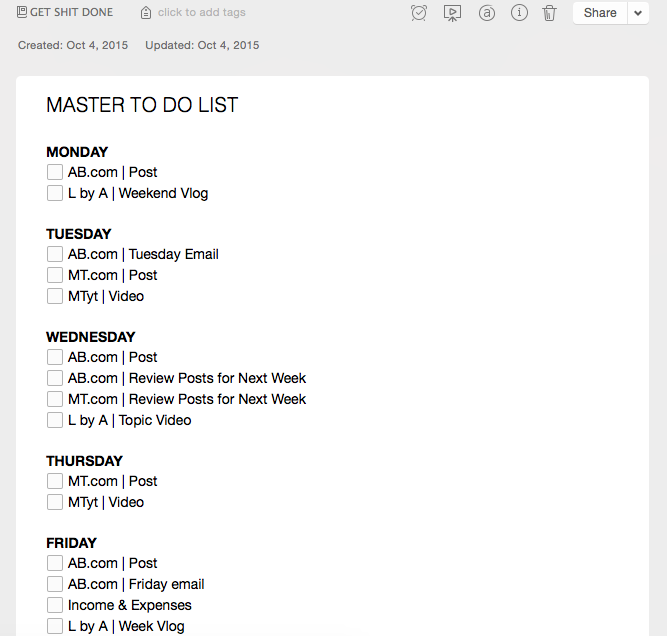 Since I’m already in Evernote planning blog posts and taking notes throughout the day it’s easy for me to pop into my weekly to do list and see what I need to work on. How do you keep to do lists? 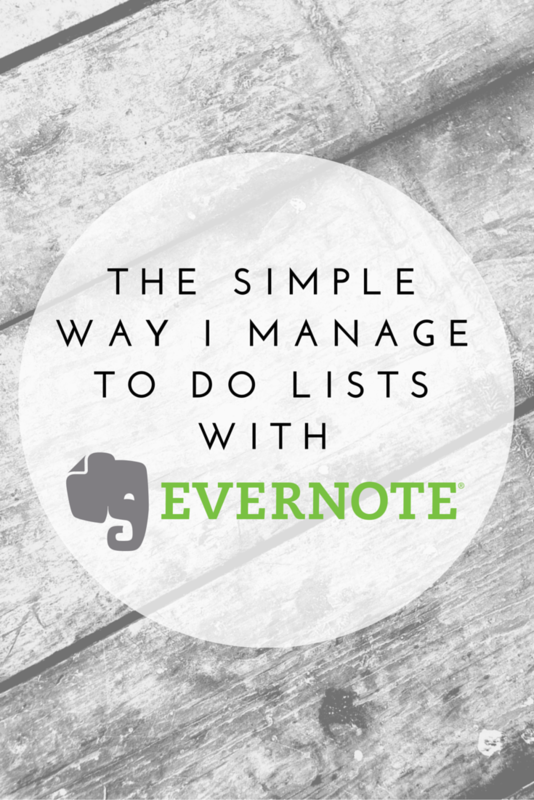 Do you have any Evernote tips for me? I LOVE Evernote! I discovered it just recently and thought to myself "Where has this been all my life?" I’m currently using it for storing all of my creative ideas that have before been scattered all over! Your idea with the "master to-do" is an epic one btw!! I’ll totally give it a try! I’m glad you love the mater to do list! It really helps me plan out my weeks. I’ve been with Evernote since its inception, and it’s a try godsend. I use it for everything but never used it for To Do lists. I may have to incorporate that next. It’s it the best? 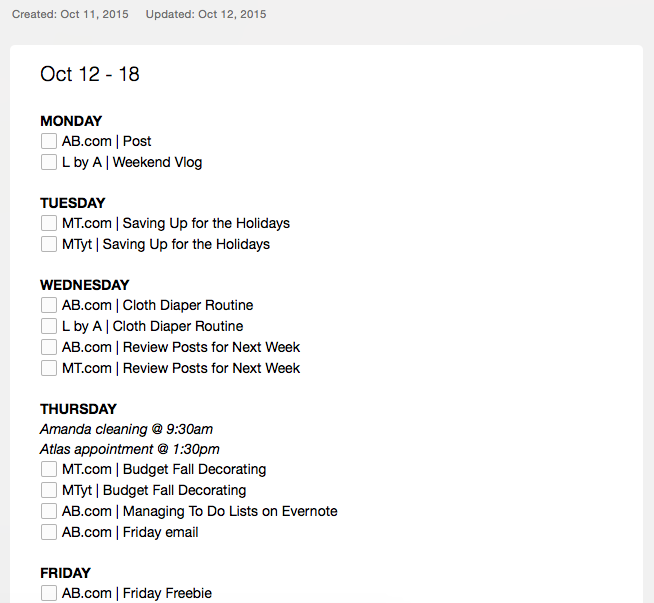 I’ve been trying to get my Evernote a little more organized lately, I’ve got a lot in there!